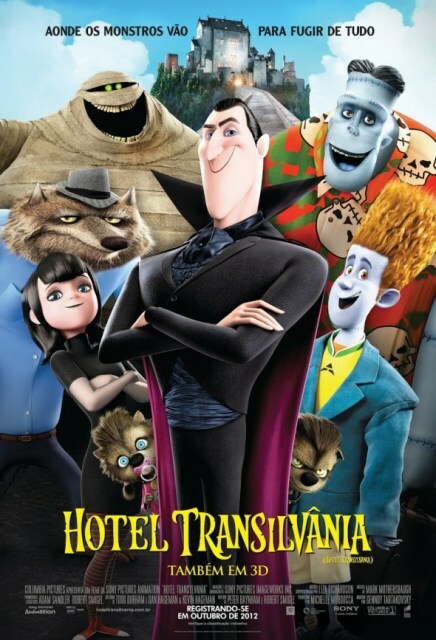 I was delighted when my daughter, Jade, asked me to take her to see HOTEL TRANSYLVANIA for her 11th birthday. I picked her and her sister up after work and made a quick post on Facebook that I was “taking my girls” to see the film its opening night. When co-running a horror blog, sometimes using your kids as a “beard” is necessary in maintaining your Terror image when partaking in less fearsome, “animated features.” Despite my cowardice on Social Media, I must confess here that, after viewing the preview for this film a month ago, I had every intention of seeing it with or without them! 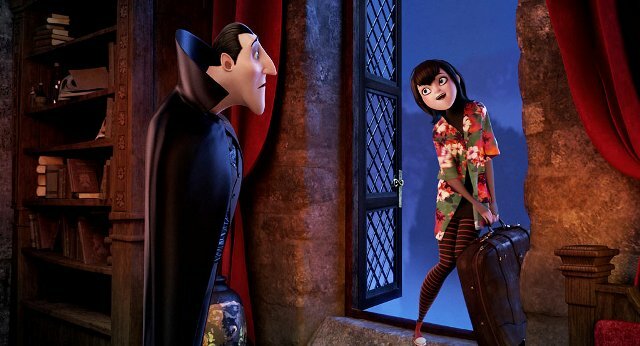 It turns out that bringing my daughters was the perfect match-up as this movie deals with another father/daughter relationship; Count Dracula and his little girl, Mavis. On the eve of her 118th birthday, Mavis is ready to spread her wings (literally in this case) and fly! She’s wants to go out and see the world; something that is counterproductive to the goals of her overprotective father. 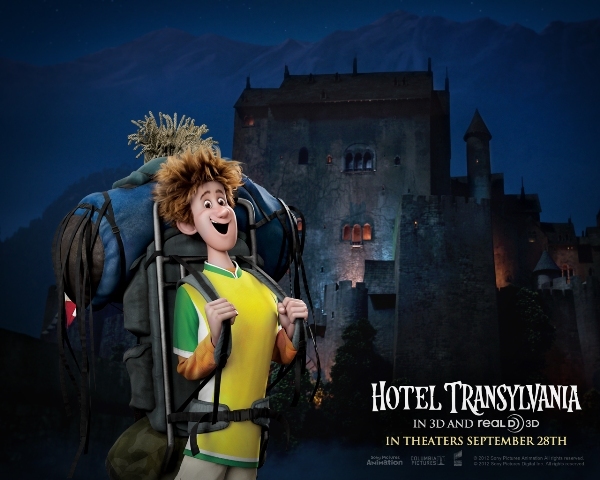 Dracula has gone to great pains in keeping his pride and joy sheltered, which was one of the primary reasons he built HOTEL TRANSYLVANIA. 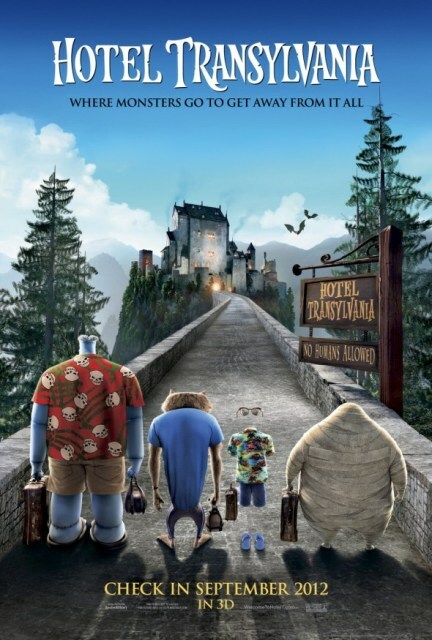 Here monsters from around the globe can enjoy a safe, human-free vacation complete with a staff of dutiful zombies and a coven of witches serving as magical maid servants. 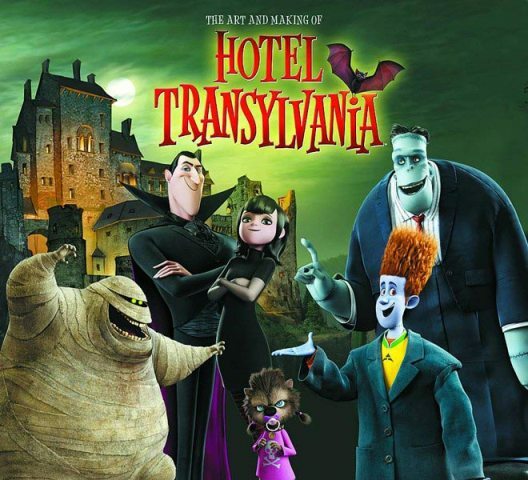 While fans will enjoy seeing the Universal classics take center stage, this hotel doesn’t just cater to the Monster “A-list.” Discernible viewers will also catch glimpses of FIEND WITHOUT A FACE, THE BLOB, and even HORRORS OF PARTY BEACH running amok in this 365 day a year “Monsterbash.” Despite such colorful guests, Mavis is determined to venture away from Drac’s domicile and seek out other venues, such as the paradise her father and late mother had fallen in love at, Hawaii (which she interprets the post card to read as “Ha-Wee Wee”). Unfettered by his daughter’s sentimentality, the controlling Count Dracula devises an elaborate scheme to quell her wanderlust. Like most control freaks, however, Dracula eventually sees his efforts come back and bite him in the…uh…neck! There’s plenty of laughs for all generations and the animation is top notch! Old school monster fans will cheer at seeing their old favorites like never before and even a humorous dig at TWILIGHT. I particularly enjoyed the film’s climax where the main characters discover what readers of this blog already know full well; that today’s humans don’t hate monsters at all, we absolutely love them! Ultimately Count Dracula learns the hard way (like most of us well-meaning, flesh & blood daddies) that sometimes letting go is more rewarding than trying to control and shield those we hold dear. Two enthusiastic fangs up for this movie, with or without the little ones! It is absolutely worth seeing on the big screen (I saw it in 2D but 3D showings are also an option) and when it comes out on DVD/Blu Ray I say…BUY IT! I foresee many future Halloweens, after the kids have gone trick-or-treating, of popping this film on while we parents check their candy to “make sure its safe” (code word for fishing out our favorite sweets for ourselves) as a yearly tradition! 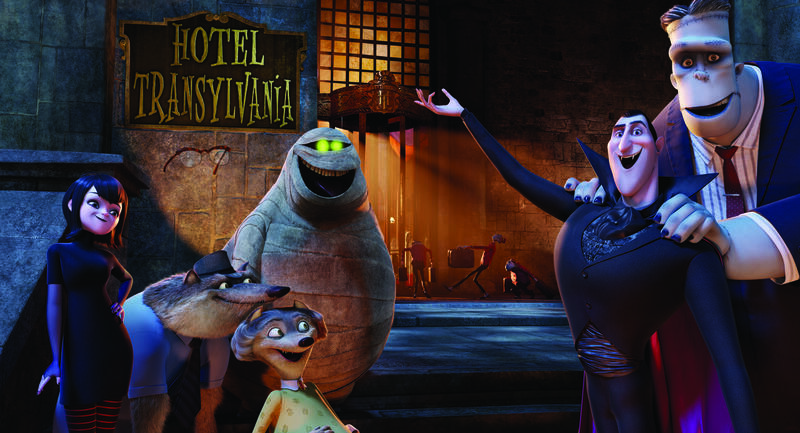 Whatever your age and whether human or monster, HOTEL TRANSYLVANIA is worth checking into! This entry was posted in Monsters, Movie Reviews and tagged Dracula, Frankenstein, Hotel Transylvania, THE MUMMY, The Wolf Man, Werewolf. Bookmark the permalink. ← Be at the Height of Halloween Fashion with MANI-YAK MONSTERS!